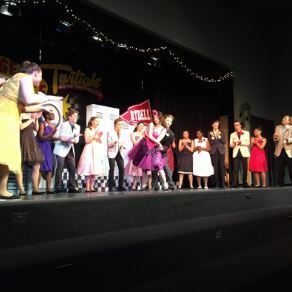 The school’s theatre department was extremely successful as they presented the musical Grease. It was fun from beginning to end and showcased some brilliant talent and creativity from both staff and students. The play starts off with Danny (Callum Fisher) and new student, Sandy (Brittnie Spriel) going over their summer romance through a song. 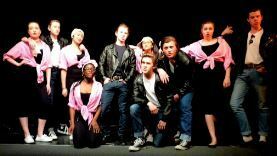 As the play progresses, “T-Birds”, Austin Costello, Jacob Brough, Theo Schlotzauer and Tanner Back and “Pink Ladies” Nicole Robinson, Charlotte Ayaz, Tess Callan-Bennink, Apple Roy and Timi Robert provided the audience with an immense amount of talent, loads of entertainment and witty humor. Costumes consisted of leather jackets, skinny jeans and high-top converses along with poofy dresses and pink chiffon scarves. The fabulous hair and make-up only completed the overall look. With complicated updos and scarlet lips, the “Pink Ladies” were the perfect amount of sassy while the “T-Birds” rocked gelled back hair and a confident attitude. Sets and props tied the whole play together adding a particular twist though still maintaining accurate representation of the scenes from the original 1978 version. Grease was amazingly directed and produced by Ms Graham, who clearly knows thing or two about creating special moments and allowing each cast member to shine individually. Music direction by Mr. Maule added a little bit of originality to the soundtrack with help from members from the pit band. Adil Kalqi and Kevin Knoblauch knew exactly how much lighting to use to create the greatest impact and most enjoyable experience for the audience. The choreography was simple enough as to ensure that each actor could perform it well and comfortably though unique as to hold the audience’s attention. 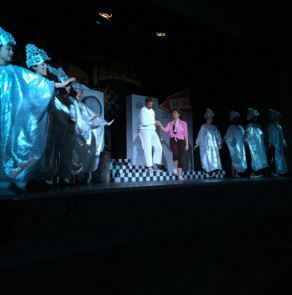 Furthermore, the audience was pleasantly surprised with the appearance of Mr. Jones as “Teen Angel” and that ridiculously high note he so eloquently hit. 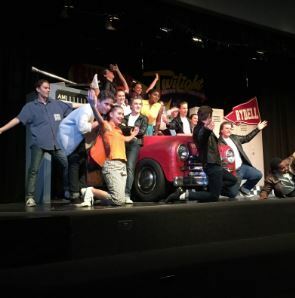 Those of you who were fortunate enough to see this particular rendition of Grease will wholeheartedly agree that it was well worth the time and effort everyone so obviously put into it. This play wouldn’t have been possible without the cast and crew’s skill, dedication and enthusiasm! MDHS is lucky to have such a talented and supportive community.